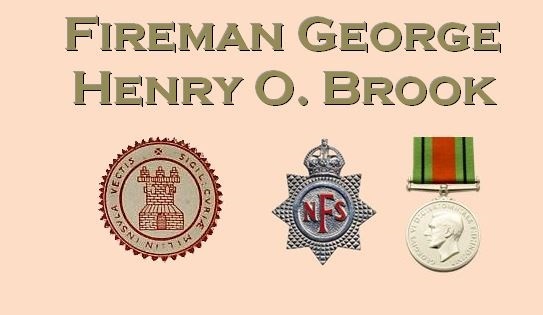 Fireman George Henry O. Brook was one of East Cowes's first formal fire brigade's members when it was inaugurated in 1908. Sadly very little can be found of his life. He appears in some reports of attendance at IWFBF events, Church Parade & etc., and sometimes represented his brigade at IWFBF committee meetings, but very little else has been recovered. There's a great deal of ambiguity regarding his third name which is listed in the title above as 'O'. In the County Press report of his death he is named Oswin and in the Probate Calendar he appears as both Osman and Osmond. He worked as a painter-decorator for many years with Messrs. E. Sibbick and Sons having first apprenticed with Mr H. Tee and finally worked for Saunders-Roe until retiring the year before his death. He was a keen footballer and a regular of the East Cowes Stars before being renamed the Vics and later became a member and vice-president of the supporters club. He performed the same role for the town's cricket club. His fire service career was remarkably lengthy as it is recorded that he was still in the service when the Second World War began and remained on the watch throughout the town's darkest days, by then as a member of the National Fire Service. His wife passed away ten years before his own death which occurred at his home, 16 Beatrice Avenue. He was 66 years of age. Rest in peace Fireman Brook.